The first odd man out is FB.11 TG117. This aircraft was one of the original 1948 batch, and the only one of that group delivered in the Pattern 2a camouflage scheme. 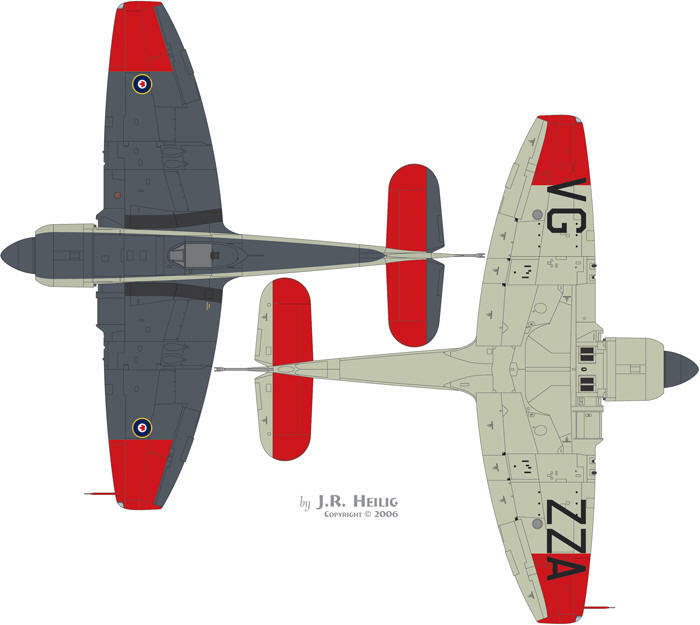 Destined from the outset for service with the Winter Experimental Establishment (a non-combat unit), the aircraft was allocated the unit identifier "ZZ", and carried the individual aircraft code "A". 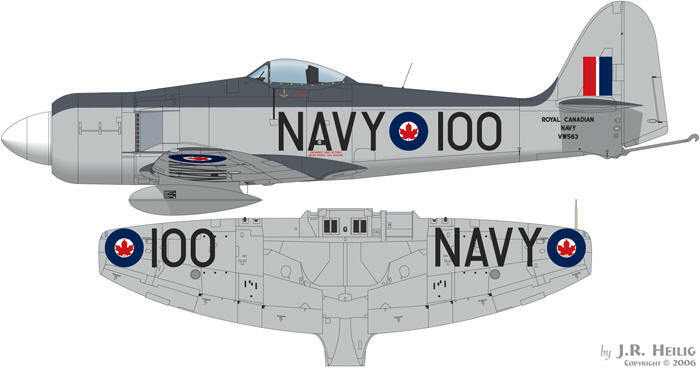 The early RCN style roundel and fin flash (of incorrect proportions) were applied in the UK, as were the letter codes, with the "ROYAL CANADIAN NAVY" identifier in a single line on the aft fuselage providing evidence of this. For its service in the far north, the outer wing panels (less the ailerons) and horizontal stabilizers (less the elevators) were painted red above and below. The illustration below shows how the aircraft appeared when first delivered to the WEE in 1948. TG117 was later overhauled and repainted by Avro Canada into what amounts to the Pattern 4 scheme. As noted above, the existence of a Pattern 4 scheme at this early date indicates that Avro actually initiated this variation, but did not apply it consistently. Codes were reduced in size on the fuselage, and somewhat unusually, split so that on the left hand side the roundel split the unit identifier. On the right side the code read "ZZ•A" as would be expected. This aircraft was lost in a fatal crash in 1951. Sea Fury FB.11 TG114 of 870 Squadron was uniquely marked. For reasons unknown, although perhaps for an airshow display, this aircraft featured a large black-soutlined "NAVY" in a light color (yellow is believed to be correct) on the side of the fuselage. Markings were otherwise standard for the Pattern 3 scheme and the 1951 timeframe in which it was photographed. On one occasion, a simple matter of not paying attention to which side of the airplane he was on likely led a painter at Fairey Aviation of Canada, Ltd. to apply the lower wing "NAVY" and aircraft code to the wrong wings on VW563. An additional error on this scheme is the maple leaves in the roundels that are touching the edges of the white disk, contrary to the standard set by the RCN. This aircraft also displays the white spinner sometimes used by VF 871. Seen aboard the Maggie during Exercise Mariner in September 1953.